If you have not yet started this wonderful way of feeding your dog the food he or she was designed for, now it is the time! I want to help you take the first step which seem to be the hardest. 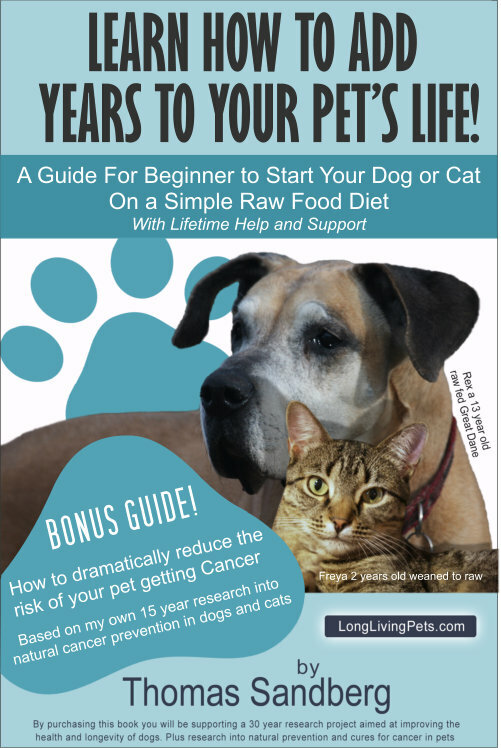 Many good books have been written about how to feed dogs and cats a raw food diet. Still many don’t dare to make the switch to raw. Some of these books make it seem complicated, time-consuming and expensive. I used to think so too when I started feeding raw using a well-known method that includes vegetables and fruits. Within six months, I realized that this was not right. Dogs and cats are carnivores, some do not agree but after researching this extensively, I do not see any evidence that makes me doubt this. Therefore, I stopped feeding vegetables more than 15 years ago and my dogs are doing very well. I have over the last 15 years experienced dogs on a raw food diet mixed with vegetables and fruits suffer from allergies (yeast). When the plant materials were dropped the allergies eventually got better. I do believe that vegetables and fruits put extra stress on the pancreas to secret more amylase in an attempt to break down the plant materials to glucose. Over time, this may affect the production of other vital enzymes important for sustaining a solid immune system. Vegetables and fruits can also upset the balance of beneficial and bad bacteria in the gut. Bacteria like yeast feed on sugar and carbs. As I mentioned above I believe dogs are carnivores and unable to digest plant material due to their short digestive tract and lack of enough enzymes needed to process and break down cellulose, mainly the digestive enzyme amylase. Dogs and cat’s digestive system is also too short for fermentation and process necessary for absorbing nutrients from plant matters. Their entire physiology is very similar to carnivores and they are in fact officially categories as carnivores. Dogs on raw food get most of their energy from fat absorbed by the liver and converted into ketone bodies, a fuel source much more efficient than glucose, and also healthier. We, humans, have this ability too; we can switch from glucose to fat burners within about 24-48 hours if we restrict glucose. That is an evolutionary process set in effect millions of years ago for cells to survive without oxygen. Dogs have the same ability. We use this in cancer prevention and treatment protocols. Normal cells can metabolize both glycogen and fat for energy. Cancer cells which have damage to their mitochondria and the nucleus have lost the ability to metabolize fat, they can only use sugar, they are what we call fermenters. That means they can burn sugar without oxygen. By restricting the supply of glycogen, we can cut their ‘food supply’ and severely hinder their ability to grow and multiply. This way of managing cancer is gaining acceptance with highly respected scientists and medical professionals. They are joining forces to bring this forward to medical trials in humans. That also means that feeding a dog a low carb diet high in fat and moderate protein would lower the risk of cancer dramatically. In my first 15 years of studying this with of a group of 80 dogs, only one got cancer that I am aware of. That’s just mind-blowing since the statistic shows that 50% of dogs today get cancer. That is one of the reasons I added 5000 dogs to my project since nobody pays any attention to my first 15 year’s results. I hope a study with 5000 dogs will change that. I also hope the question: how to feed dogs a raw food diet, will change to: why did I not know about this earlier? I mention this because when people realize how wrong commercial dog food is for their dog, they feel sorry for having fed this for years. Don’t! You did not know better! I always tell people it is never too late to switch. Every dog will benefit from eating food that their digestive system was designed for. 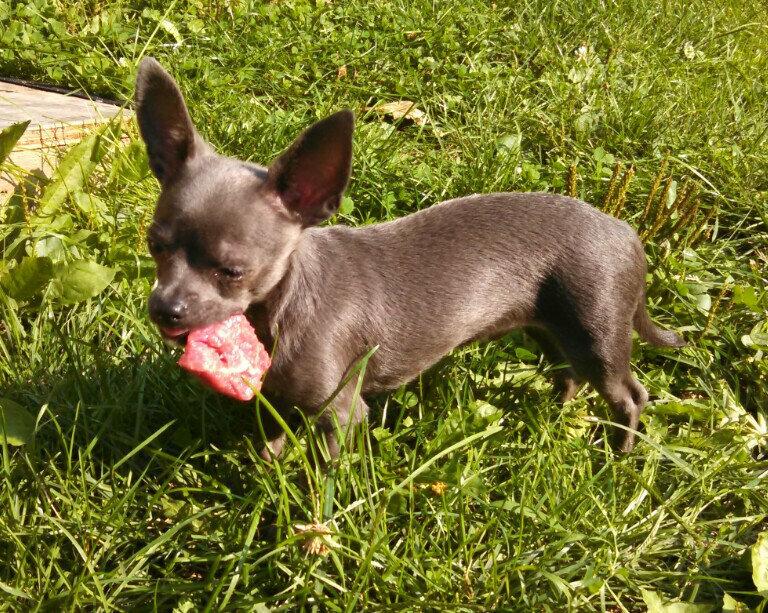 I have fed my dogs raw food for over 15 years with fantastic results. After 15 years of feeding this, I have no doubt that it is the optimum diet for dogs and cats, far superior to commercial dogs food. I see better health, longer lives, and a dramatic reduction in cancer incidents in dogs, cats too. I contribute this to the food. When you feed your pet the food their digestive system is designed for, your pet’s immune system responds and becomes strong and can better prevent deadly diseases like cancer from developing. Based on my experience and my many trials and errors, I have arrived at a very simple protocol that anyone can follow. I tested this on my dogs for 5 years before I decided I confidently knew how to feed dogs a raw food diet, and was ready to share this with other pet owners. If people understood my way more would do it since it is not complicated. Guide to get started on a raw food diet that anyone can follow! I wrote a book based on my simple plan. It will take you through the process of getting started on a raw food diet. You also get full lifetime access to me and all the support you need until you feel conformable with feeding raw. You should see changes in your dog within days. Within weeks you should see a shinier coat and cleaner teeth. The most significant changes are not that noticeable since they take place within the body. The restoration of the immune system, a dog’s first and best defense against diseases and free radicals (causes premature aging), is, in my opinion, the superior benefit of feeding raw. A dog’s immune system at its peak performance is extremely resilient and efficient in keeping a pet in good health. It’s almost superpower like! That’s my intention with this book, build a rock solid immune system to protect your beloved friend and so he can live a long healthy life. Can you limit the risk of cancer? I will leave that up to you after you read the second part of my book. All I can say based on my experience over the last 17 years (feb 2018) I believe we can. The data I collected from this period as so encouraging and to most hard to believe when it comes to the drastic reduction in cancer cases among the participants that it can’t be a fluke. I hope to support those findings with the 5000 dogs I now have in my study. Even if you feed raw now the information from the second part is worth the price of the book many times over if I’m right about reducing the risk of our beloved pets being struck with this horrible disease. *Include with this book is my full support for 3 months assisting you with the switch. 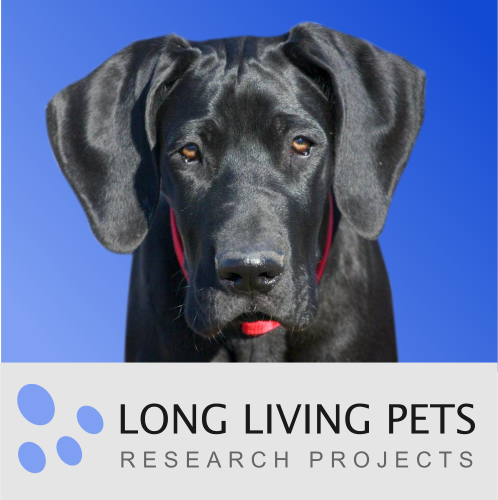 The proceeds go to support my Long Living Pets research Project.